Arizonans Recall Key State Senator, An Illegal-Immigration Hawk : It's All Politics Even Arizona voters, at least in some districts, seem to be wearying of and having second thoughts about the crackdown on illegal immigrants. They evidently perceived that State Senate president Russell Pearce hadn't quite caught up with them. 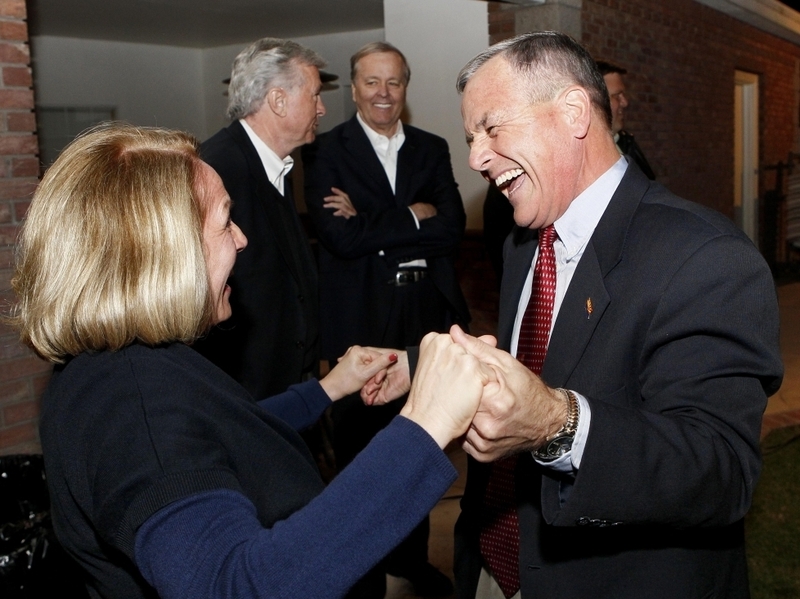 Apparent winner of Arizona state senate recall election, Jerry Lewis, with his sister, Pam Lewis Wessner, Tuesday, Nov. 8, 2011. If a hardline immigration stance seemed likely to be the path to electoral victory in any state, Arizona would seem to be it. The state, after all, was the leader in cracking down on illegal immigrants with its controversial 2010 law requiring police to inquire about immigration status during police stops based on the mere suspicions of law-enforcement officers. But even Arizona voters, at least in some districts, seem to be wearying of, and having second thoughts about, the crackdown on illegal immigrants. They evidently perceived that State Senate president Russell Pearce hadn't quite caught up with them. 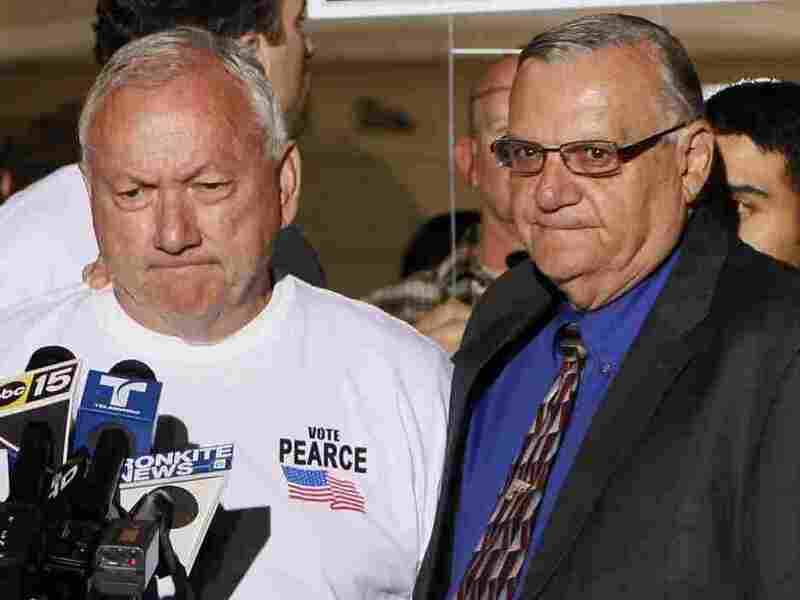 Recalled Arizona State Sen. Russell Pearce with Maricopa County Sheriff Joe Arpaio, in Mesa, AZ, Tuesday, Nov. 8, 2011. So voters in his district delivered a surprise, recalling Pearce who just happened to be one of the state's fiercest illegal immigration hardliners. And this was just a year after voters re-elected him in a landslide. Talk about fickle. Because Pearce was seen as a major factor behind passage of SB 1070, Arizona's tough anti-illegal immigration law viewed by the Obama administration as usurping the federal government's role in immigration-law enforcement, Pearce's defeat was seen in part as a referendum on that law. That reading of the result likely oversimplifies matters, however. Pearce's opponent, fellow Republican and, like Pearce, a Mormon, Jerry Lewis may have just had a more appealing personality than the veteran state senator. Also, questions had been raised about Pearce's acceptance of freebies from the Fiesta Bowl. In a district with many low-income residents and others struggling to hang on financially, those gifts may have ultimately cost Pearce since Lewis didn't hesitate to use them against the incumbent. Many residents, both White and Latino, have chafed for years over the effects of immigration and the federal government's inability to deal with it, and many early on applauded Pearce's sponsorship of the controversial Senate Bill 1070 immigration legislation. Critics, however, began to express disillusionment with Pearce's increasing hard-line stance, and some supporters began to feel conflicted when the Church of Jesus Christ of Latter-day Saints began advocating a more humane and moderate approach to the immigration issue.